When walking the streets of Glenside this fall, you may feel like you’re in the Philadelphia Museum of Art. That’s because Glenside, in Cheltenham Township, has been chosen as one of four neighborhoods in and around the city to take part in Inside Out. The program brings high-quality replicas of Museum masterpieces to communities throughout the region. Glenside was chosen because of its great location and lively artistic community. Ten works of art will be displayed throughout town for three months from mid-September through early December. People can encounter art in unexpected places as they stroll, shop, and dine in the neighborhood. All of the installations are outdoors and within walking or biking distance of each other. 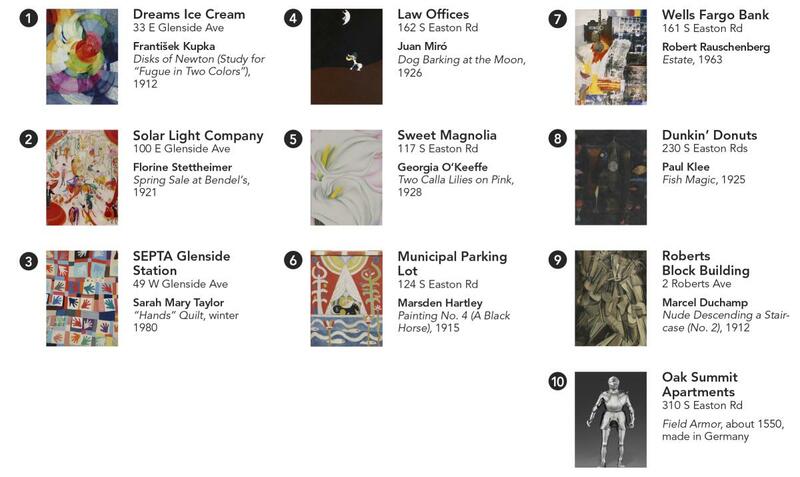 Look for paintings from famous artists including Marcel Duchamp, Joan Miro, and Georgia O’Keefe. Inside Out began at the Detroit Institute of Art eight years ago. The program, which is generously supported by the John S. and James L. Knight Foundation, came to the Philadelphia Museum of Art in 2015. Over the course of three years, artwork has been in over 20 communities in and around Philadelphia. The installation of the Inside Out artwork will be celebrated as part of a Cheltenham Township and Downtown Glenside Community Partnership event planned for Thursday, September 28th (rain date, September 29th). Come out to welcome Arcadia University students, celebrate the Philadelphia Museum of Art’s Inside Out Exhibit, and participate in a 7:00 p.m. lighting ceremony to illuminate a mural at the Glenside Train Station underpass, created by Arcadia University students and renowned artist David Guinn as part of a partnership with the Mural Arts program. Museum staff and local dignitaries will be in attendance at the event, which is open to the public. The event will also coincide with the Downtown Glenside Food Festival, which will take place from 5:30 p.m. to 9:00 p.m. Tempt your taste buds with cuisine from wonderful local eateries and a variety of food trucks at two locations along Glenside Avenue and Wesley Plaza. More information is available at 215-576-5583. The Inside Out Exhibit will be on view from September 15th through early December. Viewers can learn more about the art on display with the help of the “Art Inside Out” app, available for iPhone and Android. Download it to your device, pick a neighbor, and start exploring! Additionally, the Philadelphia Museum of Art will be hosting a Free Admission Weekend, October 13-15, inviting residents of all past and present Inside Out communities to visit the PMA for free! Show your driver’s license at any Visitor Services desk to start exploring your Inside Out favorites and the rest of the collection. Eligible Montgomery County communities include: Ambler, Conshohocken, Jenkintown, Narberth, and Norristown. Learn about Inside Out at www.philamuseum.org/insideout and don’t forget to explore the arts all around Montco at www.artsmontco.com.